Posted Thursday, December 23rd, 2010 by Greg Gladman. 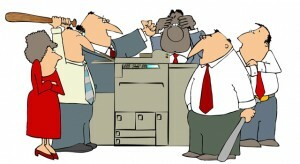 Has the time come to unplug the current office printer for the last time and move on to a new machine? Every office goes through this, so rest assured that any resource you could possible need is out there. First, though, you must figure out what is required not only to handle the volume and pace, but also increase overall productivity. This is the most important feature in a busy office. If hundreds of things are printed each day, there is no time to be waiting for jobs to process. There are machines out there that can print 50, 60 even 70 pages per minute. Be sure you get one that has the speed your office requires to keep up with the volume. If this machine is going to be used as a central printer for the office to share, networking capabilities are essential. Most printers will offer an ethernet interface to allow sharing, but consider wireless printers as well. This will not only eliminate the safety hazard of multiple wires, but it will give you the flexibility to store the machine in any corner of any room. Some modern wireless printers also allow mobile printing, so anyone within range can print from handheld devices like smartphones and tablets. Does your office have a need to make copies, or send faxes, or even save documents to file for secure, organized storage? Instead of having four separate machines to handle these tasks, you could upgrade from a printer to an all-in-one device. These types of devices save space, time and money, all of which are crucial in a work setting. Many models come in various configurations, such as a base model (Dell 1235) versus a model that offers duplex and networking (Dell 1235dn). On the other hand, a number of models offer optional upgrades that can be purchased at any time to increase the amount of input paper capacity, expand the memory that can be used or add finishing capabilities. For any office that is on the rise, it is important to get a machine that can grow as well. Though the four aspects above are probably the most essential elements to consider when upgrading to a new office machine, consider the monthly duty cycle of the unit, the security features, the total paper handling capacity and the resolution generated as well. There are so many printers being manufactured every year that if you understand your needs, you will easily be able to find one that matches most of your requirements, and still fits within your budget.